Decades of rapid economic growth have enabled Chinese leaders to dedicate more resources to R&D. According to the Organization for Economic Co-Operation and Development (OECD), China’s R&D spending accounted for just 0.72 percent of its GDP in 1991. At the time, China’s economy was the 10th largest in the world, just behind Canada, which contributed 1.58 percent of its GDP to R&D in the same year. Economic leaders during the early 1990s, such as the US and Japan, averaged even higher R&D to GDP ratios, at 2.5 and 2.7 percent, respectively. 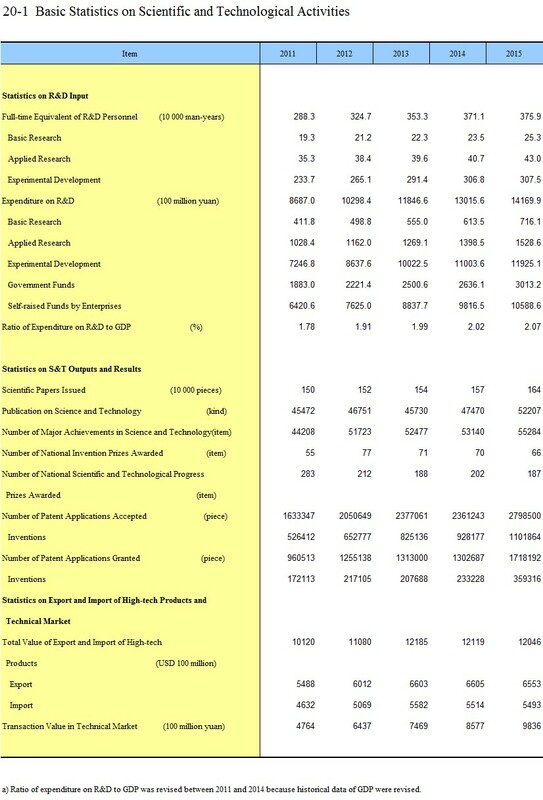 By 2015, China’s R&D expenditure had surged to 2.07 percent of its GDP. This shift was propelled in part by government measures. For instance, the 12th 5-year plan (2010 – 2015) set an R&D spending target of 2.2 percent of GDP by 2015, a mark it only narrowly missed by 0.13 percent. Beijing has since renewed its support for R&D through the 13th 5-Year Plan (2015 – 2020), which outlined Beijing’s goal of hitting a R&D expenditure-to-GDP ratio of 2.5 percent by 2020. China is already making headway in pursuit of this goal. In 2017, its R&D expenditure reached 2.1 percent of GDP. This growth is even more pronounced when considering the nominal spending increase of R&D. China’s R&D expenditure witnessed an almost 30-fold increase from 1991 to 2016 – from $13 billion to $410 billion. Presently, China spends more on R&D than Japan, Germany, and South Korea combined, and only trails the United States in terms of gross expenditure. In 2016, China’s spending accounted for roughly 20 percent of global R&D expenditure. According to some estimates, China will overtake the US as the top R&D spender by 2020. This trend is mirrored in China, with its businesses financing 76.1 percent ($306 billion) of the country’s gross expenditure on R&D in 2016. However, this high concentration of business financing has not always been the case. In 1994, business contributed only 32.4 percent of China’s R&D spending. This uptick can partially be attributed to the growing number of enterprises. According to the World Bank, the number of domestic Chinese companies listed on stock exchanges around the world has more than tripled from 1,086 in 2000 to 3,485 in 2017. Analyzing trends in business funding is muddled by the importance of state-owned enterprises (SOEs) in the Chinese economy. SOEs are subject to orders from “government officials functioning as representatives of ownership,” which in some cases makes the R&D initiatives financed by SOEs akin to government funding. SOEs also have preferential access to bank loans from China’s state-owned banks, which reduces the cost of borrowing and provides SOEs with stronger financial backing compared to private companies. Unlike their counterparts in the United States and Europe, which commonly rely on venture capital to finance R&D, private firms in China often fund their own innovation efforts, which further widens the financing gap. In contrast to financing from business, direct funding from the government is on the decline. From 2000 to 2016, the percent of R&D financed by the government dropped from 33.4 percent to 20 percent. This places China on a level comparable to the United States (25.1 percent) and South Korea (22.7 percent), but significantly below that of Russia (68.2 percent) and Mexico (67.4 percent). This trend, however, may soon shift as Beijing works to implement policies aimed at increasing government-led innovation. In 2015, Beijing launched “Made in China 2025,” a plan to increase manufacturing capability and technological innovation within key industries. As part of this push, 901 government guidance funds were launched with the goal of raising $347 billion to help lessen the burden of financing R&D for Chinese firms. Lucrative tax breaks are also being provided to firms to further incentivize investment in R&D. Companies in China financed 76 percent of the country’s gross expenditure on R&D in 2016. As a result of domestic restrictions that limit inbound investment flows from overseas, R&D paid for by ROW represents only a fraction of China’s R&D financing (0.66 percent). This rate is much less than that of the United States (5.17 percent), but is on par with other countries in East Asia, including South Korea (0.94 percent) and Japan (0.74 percent). Importantly, these figures do not capture the role of R&D centers operated by multinational corporations. For instance, Apple announced plans in March 2017 to open four R&D facilities in China – adding to the long list of more than 1,500 foreign-run R&D centers already operating across the country. It is also necessary to consider the users of R&D financing, as those conducting R&D are not always the same as those funding such endeavors. The OECD delineates four main users of R&D funds: government, business, higher education institutions, and private non-profits. The amount of R&D performed by each of these actors varies considerably by country. In the case of China, the share of R&D conducted by nonprofits is practically nonexistent. The other three users are analyzed below. Over the last several decades, Beijing has worked to boost the role of business enterprises in driving innovation forward. This effort has seen the transfer of government research capacities to SOEs. For example, in 1999, over 11,000 government laboratories were transferred to SOEs as part of an effort to better connect manufacturers with innovation centers. Moves such as these have contributed to the marked growth in the amount of R&D pursued by Chinese firms. In 1991, a mere 39.2 percent of all R&D in China was conducted by business enterprises. By 2016, that number had soared to 77.5 percent, which was greater than that of both the United States (71.2 percent) and the average for OECD economies (69.2 percent). Similar to the issue of distinguishing the sources of R&D funding, SOEs complicate how Chinese firms utilize R&D. According to China’s National Bureau of Statistics, SOEs and companies with mixed ownership made up 65.8 percent of the R&D expenditure that went toward developing new products in 2017. Private enterprises, meanwhile, only constituted 34.2 percent. Nonetheless, private firms are playing an increasingly important role. Since 2011, the percentage of R&D performed by private companies increased by 12.8 percent.2 This trend was further illustrated when Alibaba and ZTE Corp, two of China’s largest private companies, surpassed state-owned PetroChina to become the country’s top two publicly listed R&D spenders in 2016. Privately held companies, like Huawei, also play a vital role. In 2017, Huawei spent some $14.3 billion on R&D – more than American firms like Apple and Johnson & Johnson. This shift could prove promising for China. Some research has shown that when compared to SOEs, private companies dedicate higher portions of their revenue to R&D and often yield higher returns per yuan invested. China is seeking to enhance its domestic capacity for scientific and technological innovation by building a permanent manned space station. Learn more about China’s race to space. Expenditures by the Chinese government stood at 15.7 percent of total R&D usage in 2016. This ratio is similar to that of advanced economies, such as the United States (11.6 percent) and Germany (13.8 percent), but significantly lower than that of Russia (32 percent) and Mexico (36.5 percent). In nominal terms, the Chinese government spent $70.8 billion in 2016, more than any other country in the world. Government-driven expenditure has contributed to the development of highly visible technological advancements, particularly those made by the China National Space Administration. The Tiangong-2 space station and the “Micius” quantum satellite – the first of its kind – are just two such examples. More recently, China’s Chang’e 4 lander became the first spacecraft to land on the far side of the moon. Institutions of higher education perform only a small portion of China’s R&D, averaging just 9.3 percent of R&D usage between 1991 and 2016. This is considerably less than that of Japan (13.5 percent), Germany (17.3 percent), and Finland (20.1 percent). Several factors are at play when considering the role of academic institutions in China. The country’s restrictions on intellectual freedom, coupled with a focus on the graduate employment rate over scientific output, have impeded innovation within China’s universities. President Xi Jinping specifically called on China to “strengthen basic research, and make major breakthroughs in pioneering basic research and groundbreaking . . . innovations” in his speech at the 19th Party Congress. Additional insight can be gleaned by considering the industries targeted by R&D initiatives. Official government figures show that computer and communication manufacturing attract the most funding from government, business, and academic institutions – totaling some $29.6 billion in 2017. This focus on information and communication technology has helped pave the way for breakthroughs like the Sunway Taihu Light, the world’s second fastest supercomputer. It has also led to commercial success in niche markets. Chinese drone manufacturer DJI, for instance, is reported to control up to 74 percent of the global drone market. Huawei has emerged as one the leading companies working on next generation mobile communications technology, including the roll-out of 5G networks, which are expected to be 50-100 times faster than 4G. Research and development can also be distinguished by its desired outputs into three areas: basic, applied, and experimental development research. Definitions for these areas are outlined in the table below. Beijing has consistently poured the largest share of its R&D resources into experimental development, averaging roughly 80 percent from 2000 to 2016. According to an OECD report, this has contributed to a growing output from “engineering-oriented domains,” which has made it easier for manufacturers to quickly adapt products and services to the domestic market. China’s preference for experimental development research far outstrips that of other leading economies. Innovation powerhouses like the United States and Japan devoted just over 62 percent of R&D on experimental development research. Conversely, China’s R&D spending on basic and applied research, which are critical to the development of new scientific ideas and cutting-edge technologies, proportionally lags that of other major powers. Basic research in China averaged around 5 percent of total R&D expenditure between 2000 to 2016, while the share of applied research dropped from 16.9 percent to 10.3 percent. Over the same period, the US poured 17.7 percent of its R&D funding into basic research and 20.3 percent into applied research. In nominal terms, China’s basic and applied expenditure was roughly $70 billion in 2016, more than South Korea ($30.5 billion), Japan ($53 billion), but significantly less than that of the US ($186.6 billion). To supplement the prevalence of experimental research, Chinese leaders are promoting the importance of basic and applied research. President Xi Jinping specifically called on China to “strengthen basic research, and make major breakthroughs in pioneering basic research and groundbreaking . . . innovations” in his speech at the 19th Party Congress. However, McKinsey notes in a 2015 report that regulatory hurdles, insufficient IP protections, inefficient government funding, and underinvestment by private-sector players continue to stifle China’s endeavors to promote science-based innovations. Due to lack of reliable data, funding from other national sources in China are not analyzed below. 12.8 percent of business enterprise R&D, not overall R&D. Some of the users of Hikvision cameras include the US Army and the Memphis Police Department. Scott Kennedy, “The Fat Tech Dragon,” Center for Strategic and International Studies, 2017. Mckinsey Global Institute, “The China Effect on Global Innovation,” McKinsey & Company, 2015. OECD, “G20 Innovation Report 2016,” 2016. TechnologyWhat’s driving China’s race to build a space station?